There’s no getting away from it. Katie Eary’s show stopping, dramatic jewellery demands your attention and is as impactful as the white blonde designer herself. She has already been achieving massive critical acclaim for her menswear line since her launch in 2008. 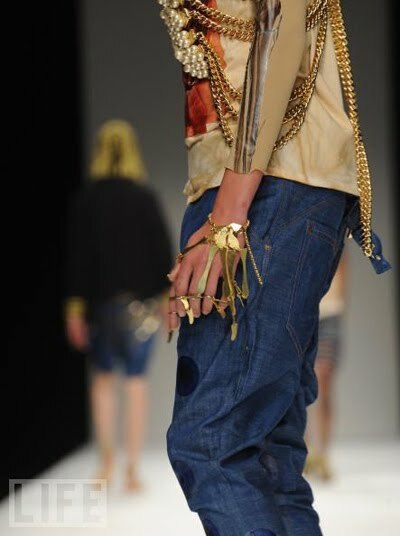 Opulent gold and pearl rib cages sit alongside brass hand and foot pieces. This London-based fashion designer is certainly an unstoppable, inevitable hurricane ripping her own path through fashion. For S/S ’11, she is to show at LFW under the umbrella of NEWGEN and has already shown her pre-collection in Paris, so fash pack watch out. Eary graduated from the RCA in 2008 with an M.A in Menswear and on graduating, Selfridges flagship store commissioned her to create nine body/head pieces for their LFW window display. That same month, Kate Moss donned a number of Katie’s designs for Mario Testino’s shoot for Vogue UK. This jewellery celebrates your inner warrior but in beatific form, the nearest you can get to wearing art. And Eary should know, as the super styish and avante garde Roisin Murphy wore her Swarovski gold coat on her tour night after night for her opening extravaganza. Fashion peeps, if it’s good enough for Roisin…. In fact, other celebrities approaching Katie to design for them or purchase her work include style heavy weights such as Rhianna, Kelis, Gaga, Black Eyed Peas, MIA and oh, Kanye West actually has one of the gold Skeletal hands. Her gothic metal skull masks with chains, feathers or pearls can be worn as a warrior statement full on and face off funky or swept to the side of the head and worn ironically as a fascinator. I like that. I like the way that this designer plays with form, clashes textures and relays strength throughout her work. 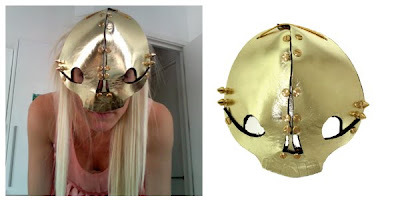 This jewellery takes cajones to wear it (whether a man or woman). Not everyone can. Be brave. Release your inner warrior. Katie Eary’s accessory collection will be exclusive at Kabiri from 20th July 2010, and is strictly limited quantity. 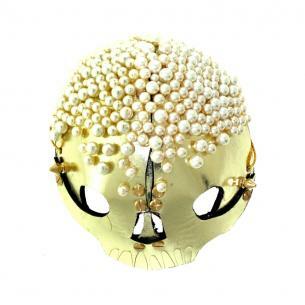 The skeletal masks and hand pieces will be available online at http://www.kabiri.co.uk/ whereas the large scale body pieces are exclusive at Kabiri’s concession in Selfridges, Oxford Street. Kabiri is one of London’s leading jewellery stores, helping to launch the careers of many independent jewellery designers since their launch in 2004. With carefully curated collections from over 60 designers each season, Kabiri is is the ‘go-to’ store for exclusive jewellery designers. Please feel free to leave a comment about Katie Eary’s jewellery. I’d love to hear from you. I went to Kabiri to see Katie Eary’s masks and they’re really impressive and quite big. Previous post: New fragrance from Halston. (Hedonism and the Last Days of Disco).